Casino Street Zone is the second level in Sonic the Hedgehog 4: Episode I. It exhibits many gameplay elements common of levels with a carnival/casino theme. The zone is known for the Score Attack gimmick in Act 2 of the PartnerNET build where Sonic was enclosed in a pinball area and had to get 100,000 points to proceed to the next level. This was mostly unfavoured by fans and it was later changed to an iPhone-exclusive act, with the console version recieving an entirely new Act. In addition, Act 2 also received a new music track in the console version due to it being heavily criticised as being too short, and the fact that the original would only fit the short Score Attack level. On September 23, 2010, Joystiq revealed a trailer and some information regarding the level, as well as a few statements from Ken Balough. 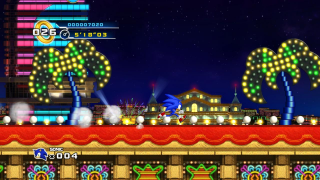 While this level shares a number of gameplay elements with Sonic 2's Casino Night Zone, Balough stated that Casino Street Zone was not inspired by any previous levels. The new gimmick for this act appears to be playing cards which Sonic can jump on before they flip over, and even run on a moving deck of cards. In addition there are different versions of the cannons, pinball tables and rolling tunnels, as well as the Batbot and Crawl badniks from Sonic the Hedgehog 3's Carnival Night Zone and Casino Night Zone. The new act two found in console versions is a popular place to stock lives as several lives can be earned in each playthrough as there are cards that can be turned over that will earn lives if three 1-up cards are matched up. Over time, hundreds of lives can be earned from this level. Super Sonic will get Jackpots every time he enters the slot machine, which makes getting perfects in Score Attack relatively easy. This is not featured in the iOS version. Batbot - Flying bat badnik that follows you around until it is killed or outrun. Bubbles - A blue bubble badnik. Red ones have retractable spikes. Crawl - A badnik with a bumper as a shield. The music is loosely based off of the Spring Stadium Zone theme.